This time of year, it can be hard to resist the pull of sweet potatoes — roasted, mashed with butter, and topped with a combination of delectable treats from maple syrup to pecans to marshmallows. But did you know that the green leaves of the sweet potato plant also have the potential to be a tasty, nutritious food? 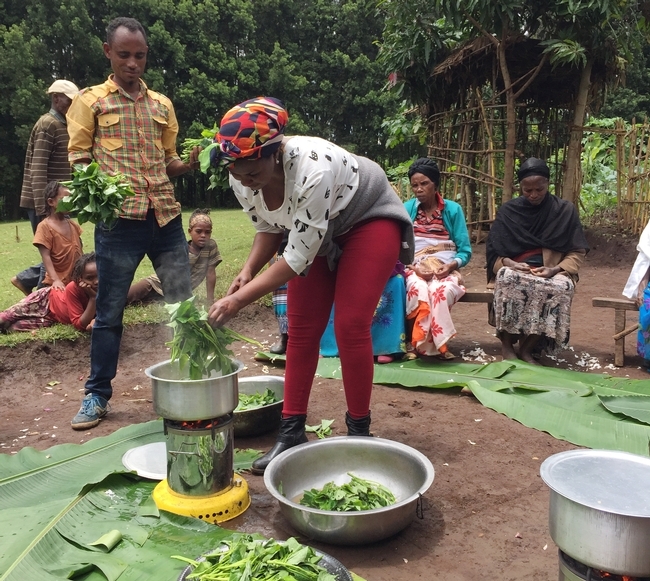 In Ethiopia, where sweet potatoes can be a staple crop, UC Davis graduate student Lauren Howe recently helped farmers taste test the leaves and consider this familiar crop in a new culinary light. 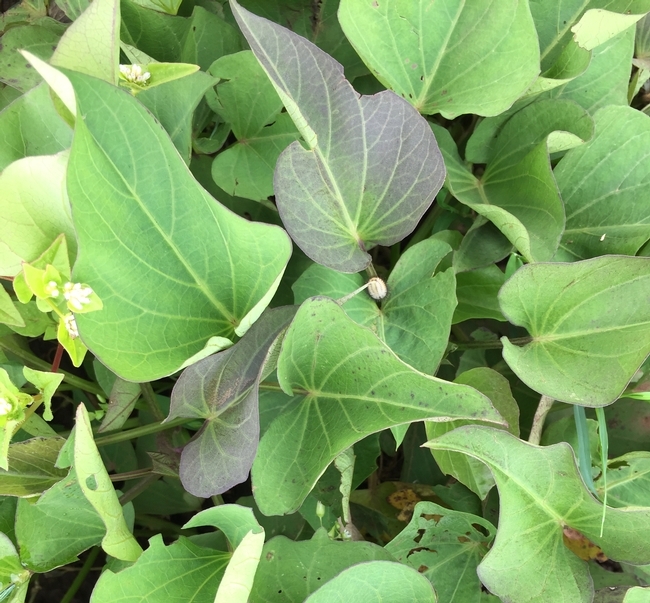 The leaves of this drought-tolerant plant offer farming households there an alternative — and nutritious — food in the lean season, while they are waiting for its starchy, tuberous roots to be ready to eat. Introducing sweet potato leaves as a food option is intended to help farmers better diversify their families' diets, to include a wider variety of vegetables in addition to staple foods, especially during the dry season. 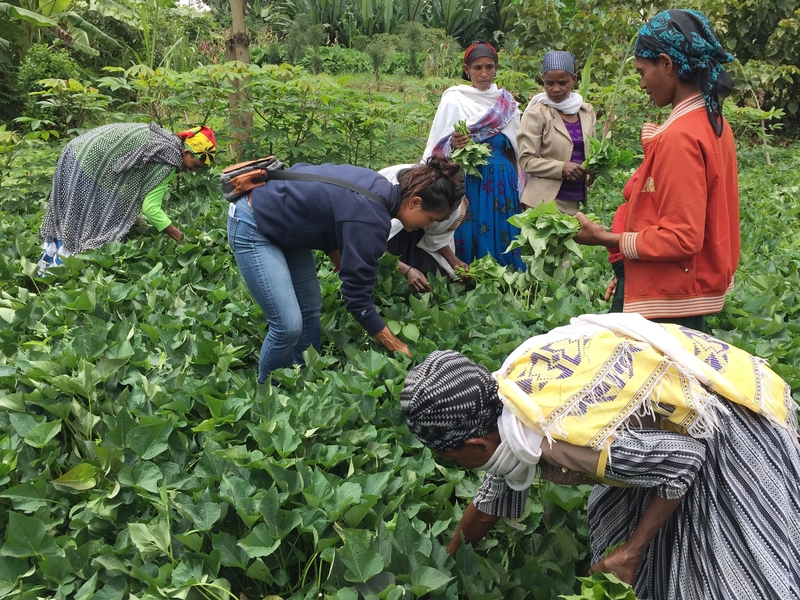 Lauren shared her experiences in Ethiopia on the Agrilinks website, where she recently won the Agrilinks Young Scholars blog contest with her writing and a short video from the field. 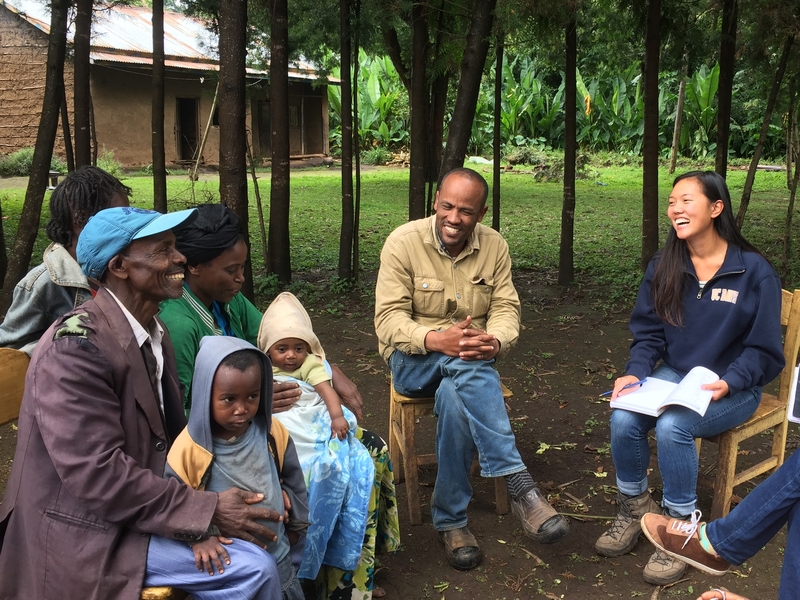 From right, Lauren Howe of UC Davis and Tesfaye Kassa of SACE interview farmers about how they currently manage sweet potato crops on their farms. Lauren traveled to Ethiopia this summer to work with an organization called Send A Cow Ethiopia (SACE), on a Trellis Fund project. As part of the Horticulture Innovation Lab, each Trellis Fund project connects an organization in a developing country with a grad student from a U.S. university, to work together to benefit local farmers, while building the capacity of both the local organization and the student. In Ethiopia, SACE helped Lauren better understand local contexts by connecting her with farming households to interview about their current farming practices and the role of sweet potatoes in their diets. Later they traveled to meet with a group of about 25 farmers in the Ukara community to harvest leaves, cook together and discuss their perceptions of the leaves as a vegetable option. Lauren harvests sweet potato leaves with farmers in Ukara. In Ukara, the group prepared the sweet potato leaves three different ways – sauteed, cooked with corn or maize flour in a dish called fosese, and in a salad. After preparing and tasting the sweet potato leaves, the group in Ukara discussed which dish they preferred, whether they would adopt this new practice of eating sweet potato leaves, how this practice might affect their forage supply to feed their livestock, and what their friends and family members might think of this new food. "I deeply appreciated how food is truly a universal language and the preparation, cooking and act of eating itself are relatable across cultures," Lauren wrote in her blog post. "This project is about creating tasty dishes to persuade people about the nutritional benefits of a new ingredient. It is gathering families, friends and neighbors to sit down to a communal meal (already a strong Ethiopian practice), breaking bread together, sharing stories, experiences and hopes for the future." For more, go read the rest of Lauren's blog post and check out her short video too. Lauren at a taste test in another community called Gurumo Koysha, where farmers overwhelmingly preferred the sautéed sweet potato leaves to the sautéed kale. The activity was intended to be a blind taste test, but Lauren reported that keeping the dishes secret was more difficult to do than originally planned. 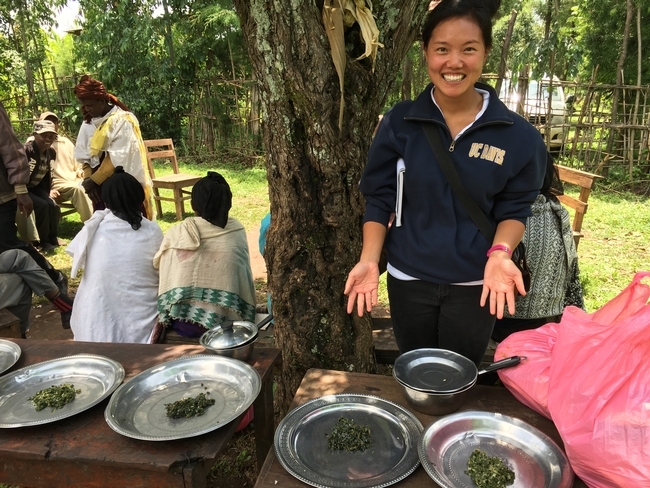 Lauren's experience with a Trellis Fund project in Ethiopia was supported by the Horticulture Innovation Lab, a research program led by Elizabeth Mitcham of the UC Davis Department of Plant Sciences, with funding from the U.S. Agency for International Development. With a focus on fruit and vegetable innovation, the Horticulture Innovation Lab seeks to empower smallholder farmers in developing countries to earn more income and better nourish their communities — as part of the U.S. government's global Feed the Future initiative. Past research from the Horticulture Innovation Lab has focused on other leafy greens, specifically African indigenous vegetables, and also on sweet potatoes themselves (orange-fleshed sweet potatoes, that is). Though the program has not done in-depth research on sweet potato leaves for human consumption beyond this small Trellis Fund project, you can find more information about eating sweet potato leaves and tips in this bulletin from the University of Arkansas Cooperative Extension, and a wealth of information about sweet potato farming and gardening from the University of California Vegetable Research and Information Center. in is very nice latest findings on sweet potato.sweet potato as salad consumption is new of others. Thank you for sharing this inspiring piece which really exemplifies agricultural diversification at is most organic and best. This simple insight may mean a major income boost to the farmers involved and so I hope that communities will start to embrace these 'new' greens. I happened across your interesting video. Clearly putting education in action to help your fellow man. Thank you for your work it’s the kind of news I’d like to hear about instead of network news. Keep it up!! When I lived in West Africa, we at sweet potato greens every week cooked with hot peppers, palm oil and chicken served over rice. It was one of my favorite dishes!